Over 850 race tracks have operated in Canada over the years and they're listed here. I have been making some updates to the site this winter. There have been some updates to track database entries (too many to note) and I've added quite a few photos. Feb 10, 2019: I have added Google maps locations for about 25% of the tracks in the track database. My main focus has been on Ontario, the Territories and the Maritimes. See Speedway Park in Concord, ON for an example. There are still some missing from these provinces and I will continue to research them and update the site. I will add Quebec and the western provinces soon. Bob Lawless sent me several Kingston Speedway photos. The Toronto Star Archive is available through the Toronto Public Library site and can be used for educational and research purposes. I have also found some photos that people sent me over the years and got lost in my computer. The following track database entries have had some photos added: Abbotsford Airfield, Airdrie Airport, Barrie Speedway, Central Canada Exhibition, Circuit Gilles Villeneuve, CNE Speedway, Hamilton street circuit, Hastings Park, Le Circuit Mont Tremblant, Minoru Park, Mosport, Mountain Speedway, Nilestown Speedway, Pinecrest Speedway, Quinte Dragway, Shepard Raceways, Skydome, Speedway Park (Stoney Creek), St. Thomas Raceway, Sundance Speedway, Toronto Indy, Toronto Motorsports Park, and Windsor Motor Speedway. 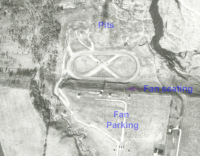 I have also been going through the University of Toronto's 1954 aerial database and added aerial photos for the following tracks: Ailsa Craig Raceway, Ascot Park Speedway, Bluewater Speedway, Bridgeport Speedway, Meadow Park Speedway, Oshawa Motor Raceway, Pinecrest Speedway, Pleasure Valley Speedway, Sarnia-Glendale Speedway, Shannonville Speedway, Speedway Park (Concord), Stratford Speedway, St. Thomas Raceway, Sun Valley Speedway, Teviotdale Speedway, Tilbury Speedway and Warwick Raceway. The 2018 season wrapped up with the annual Applefest Shootout Weekend. Unfortunately, I had to miss Friday night and I was sick for most of Saturday so I didn't shoot the entire day. Monster trucks and OSCAAR Hot Rods were added to the schedule to make up for previous rain-outs. It was the annual Labour Day Classic double-header. Again the rain came and washed out the night. We only had two Junior Stinger heats in. The Action Sprint Tour made its first-ever visit to Brighton. We can always use more sprint car racing. It was time for the always-popular Fan Appreciation. In three hours and fifteen minutes we ran full fields in all the regular classes plus vans. The sprint cars were back. After yet another rain-out on July 14, we were back to racing with all the Brighton classes, the Vintage Modifieds and Wall of Fame Night. The sprint cars were back and the karts put on a demonstration. For the first time in about 10 years I spent most of the night sitting the grandstands watching the races. I did sneak away and shoot the OSCAAR Hot Rod series though. We got back to racing after yet another rain-out on June 23 with all five classes. After a rain-out in May the Southern Ontario Sprints were able to get a full night of racing in. Vans and Fan Appreciation were part of a full night of racing. The weather finally cooperated and we had a full night including bus racing. I was able to visit a track other than Brighton on June 1 to take in the Bone Stocks, Legends, Hot Rod and Modifieds. All three classes had good car counts. The still fairly new Hot Rod class had 16 cars, that all looked great. We had a rainout on May 19. On May 26 the rain came after the second Stinger qualifier and the night was done. I shot some photos of the hot laps. Four classes of action-packed racing. After a rain-out on April 28, the 2018 season got underway. I was able to put aside my military history writing for a while to finally get back to updating the history part of this site in the fall and winter of 2017-2018. March 13, 2018: Another update of the track database - lots of changes. I have also changed the database from Access to MySQL, which I hope will fix the slowness issue. March 3, 2018: Added a Shearing Speedway program cover and photos for Oakwood Speedway, Richelieu Park, Langford Speedway and Peterborough Speedway. December 21, 2017: Photos added for Davidson Airport. December 20, 2017: Photos added for Lansdowne Speedway, Saratoga Speedway (QC) and Murillo Speedway. December 13, 2017: The track database has finally been updated after about five years! There are more changes that I can cover here. Several tracks closed, some name changes, lots of facts updated and even some new entries. Also added were photos for Orillia Speedway, photo and program for Beamishill Speedway, photos for CNE Speedway, Edmonton Exhibition, Brighton Speedway (paved), Seymour Speedway, Mosport Speedway and Tweed Speedway. November 29, 2017: The first update is to change how the historic photos appear. They are now a Facebook-style browser, the same as I changed the Brighton Speedway galleries prior to the 2017 season. While doing this update I took the time to add photos for Wasaga Beach Speedway, Aylmer Fairgrounds and Speedway Park (Concord, ON). CanadianRacer.com has been the official track photographer at Brighton Speedway since the 2009 season. Copyright Notice: All content and original photos of this site are the copyright of CanadianRacer.com / Motorsports Central and may not be republished without permission. Articles with an author named are copyright of their respective authors. Some photos are from other sources and are labelled as such - these photos are copyright of their respective photographer. If you are the copyright holder of any of these photos and don't wish them to be posted here, please contact me and I will remove them.